The NPPL has moved the event back to the North side of the pier and the Surf City open is starting to take shape. 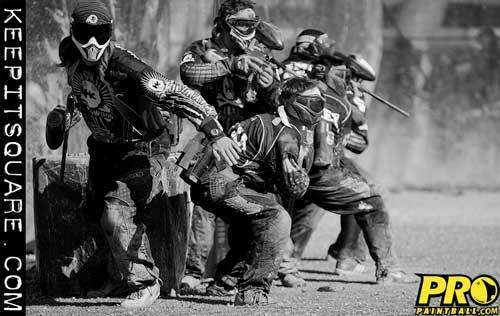 Read on for the latest paintball news and rumors from the event. Bea Youngs, Kat Secor, and Katie Kelly of Destiny are making their return at NPPL HB. They will be joining the girls from Poison Ivy in division 1. We watched Poison Ivy compete at the Malaysia World Cup and were very impressed with the level of play. They should do very well in the NPPL format. Good luck Girls! Last week we dropped word that Infamous might be making a late entry into the NPPL. ProPaintball insiders confirmed that this is the case. According to sources, Infamous will have Travis Lemanski, Kali Rudolph, Bobby Aviles, Nicky Cuba, Drew Templeton, Zack Patient and Greg Siewers rostered at NPPL HB. Portland Uprising made several last minute adjustments to the roster. According to ProPaintball insiders, the team will feature Ryan Tucker, Tommy Tucker, Aaron Ormrod, Nicholas Omrod, Blake Bearham, Johnny Grier, Ryan Martin and Jimmy Hickey. The guys will be shooting MacDev Clone GT’s and sporting head to toe PBRack paintball gear. Sounds like a few pro teams will be getting in a last minute grind at Whittier on Thursday morning. Word is LA Critical, Portland Uprising, and Texas Storm are doing a bit of warm up before they walk the fields later in the afternoon. HK ARMY blows it, picks a new name. HK Army decided to play Division 1 instead of making the leap to pro. The guys will be playing as Giant HK and will probably show up to one or two events max. So much for the dream of one day having a pro team. Stay tuned for more paintball news and rumors as they develop. Like ProPaintball on facebook!